Chevrolet Volt review | What Car? What is it? 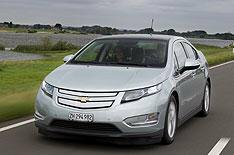 The Chevrolet Volt is essentially an electric vehicle (EV) with a back-up plan. Plugging the Volt into a domestic power socket for four hours delivers a full charge, and depending on your driving style (and a few other factors), itll take you up to 50 miles on pure electric power. However, while most EVs leave you stranded when the batteries run down, the Volt keeps going because a 1.4-litre petrol engine kicks in to supply the cars electric motor with an alternative source of electricity. This means you can keep going as long as theres petrol in the tank, and that you don't constantly worry about running out of power. The Chevrolet Volt is virtually identical to its sister car, the Vauxhall Ampera, which was recently named as our Green Car of the Year 2011. Whats it like to drive? Given that both cars use the same technology, it'll be no surprise that driving the Volt is virtually indistinguishable from driving the Ampera. Performance is perky, because the 148bhp electric motor gives a hefty 273lb ft of torque as soon as you touch the accelerator. Pick up feels brisk and instantaneous away from the mark, and the car is always effortlessly flexible. Even more impressive is the Volt's refinement. In full EV mode you dont hear a peep from the powertrain, while wind and road noise are also well isolated. Even when the petrol engine is called into action, it stays impressively quiet. Sure, the engine has to work harder if you bury the accelerator (although it doesnt directly correlate with your throttle inputs, which can take a bit of getting used to), but most of the time youll barely hear it at all. The Volts suspension also contributes to its relaxed nature, because its extremely good at smothering potholes and large bumps. However, it doesnt deal with smaller bumps quite so well; when the road surface is slightly scruffy theres a decidedly knobbly quality to the ride. The steering can be a little unnerving, too. Its pretty vague around the straight-ahead, which means that maintaining a straight course takes a little too much concentration. Youre conscious when cornering that the Volt is a heavy car, although it always feels secure thanks to plentiful grip. Whats it like inside? Again, its pretty much indistinguishable from the Ampera, which is both a good and bad thing. On the plus side there's lots of adjustment for the seat and steering wheel, all four seats have decent head- and legroom, and the boot is a good size at 300 litres. Sadly, there's also a lot to grumble about, including thick windscreen pillars that limit your view forwards, and a tiny rear window rearward visibility is extremely poor. The dashboard also frustrates. Instead of conventional buttons, it has touch-sensitive markings that arent quite sensitive enough. What's more, there are so many of them that its hard to pick one out at a glance. The materials in the cabin dont feel particularly special, although most of them look smart and feel solid. Should I buy one? When we first drove the Volt as a pre-production car, we were told to expect sensational fuel economy and emissions figures. However, even Chevrolet admits that the 235mpg and 27g/km of CO2 that it achieved in the recent official tests are rather optimistic. The truth is, the numbers are hugely dependant on how the car is used. We can safely say, though, that the Volt will cost peanuts to run. Aside from tiny fuel bills, youll qualify for zero road tax, escape the London Congestion Charge and pay company car tax at a rate of just 5%. The real question is, should you buy the Volt over the Ampera? Well, we wouldnt blame you if you did. The Volt doesnt look as good as the Ampera, but it costs 450 less (at 28,545 after the maximum Government grant), and gives you leather upholstery as standard.